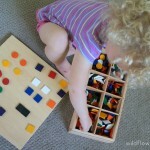 I am incredibly impressed with the diversity and range of the colorful, wooden manipulatives of Spielgaben. 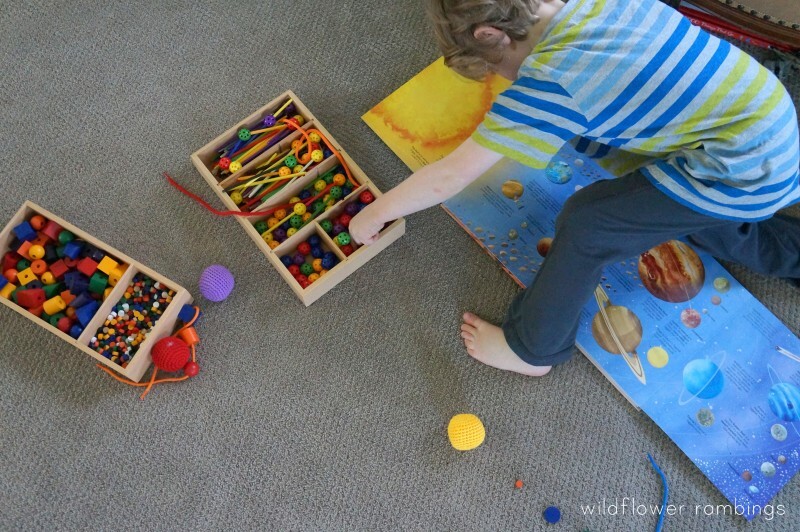 I believe that children are sensemakers; hands-on materials allow them to explore learning concepts long before they are able to wholly define them. 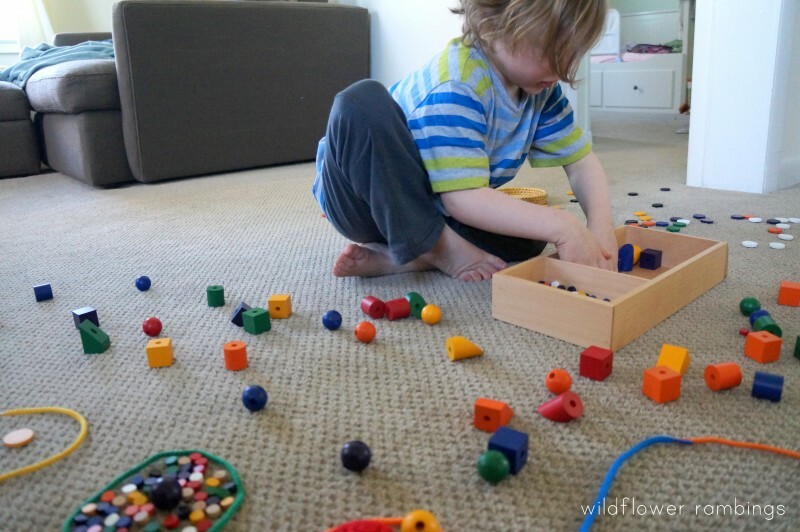 Spielgaben is the perfect tool to teach and to give children an open environment to learn and create. 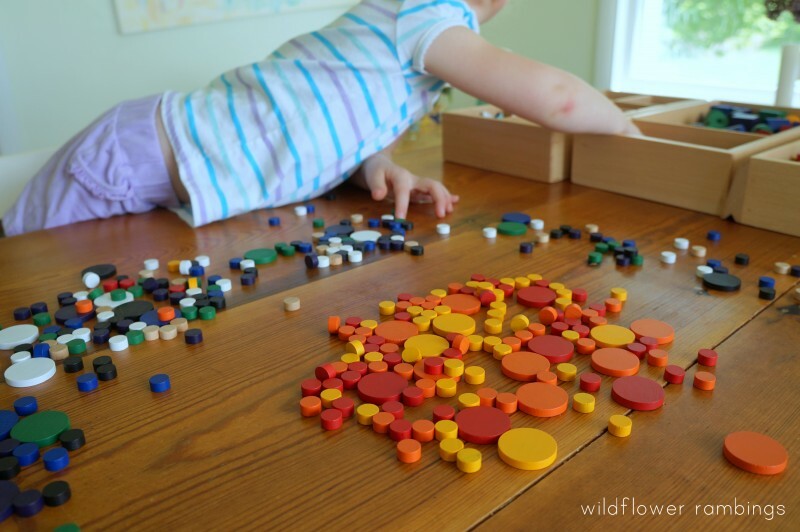 We are so thrilled with our decision to purchase the amazing Spielgaben set and to have Spielgaben as a blog sponsor. 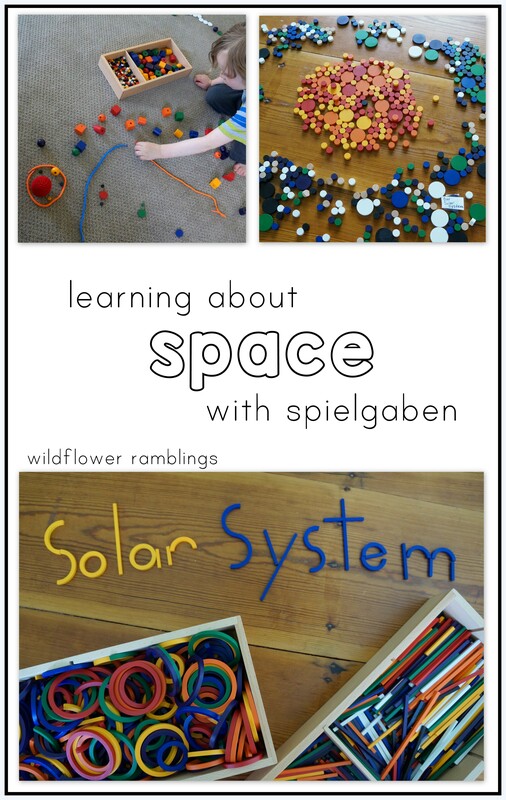 Today, we are excited to show you how Spielgaben has extended our science work with learning about the Solar System and space. My son loves all things space and adores learning about our Earth, the moon, the sun, the Solar System, the Milky Way, and the universe! 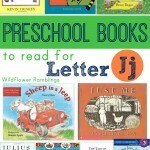 Children learn in many different ways: reading, writing, viewing, listening, speaking, creating. 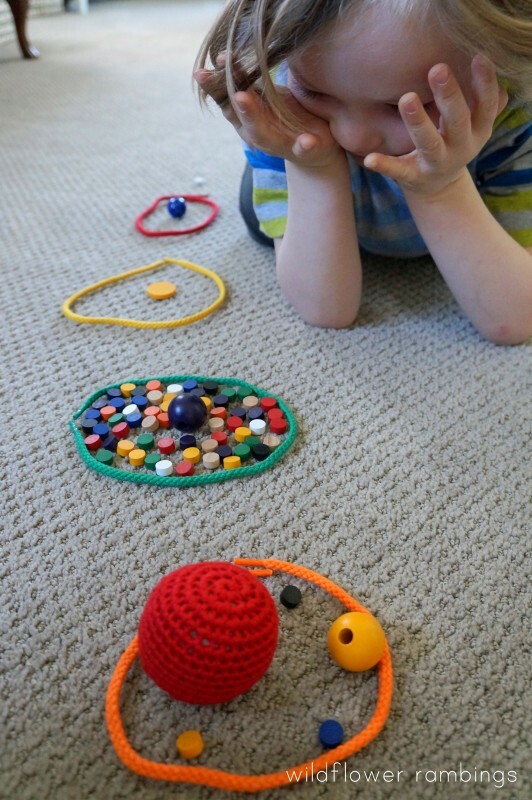 For most learning, children need to create or visualize what they are experiencing. 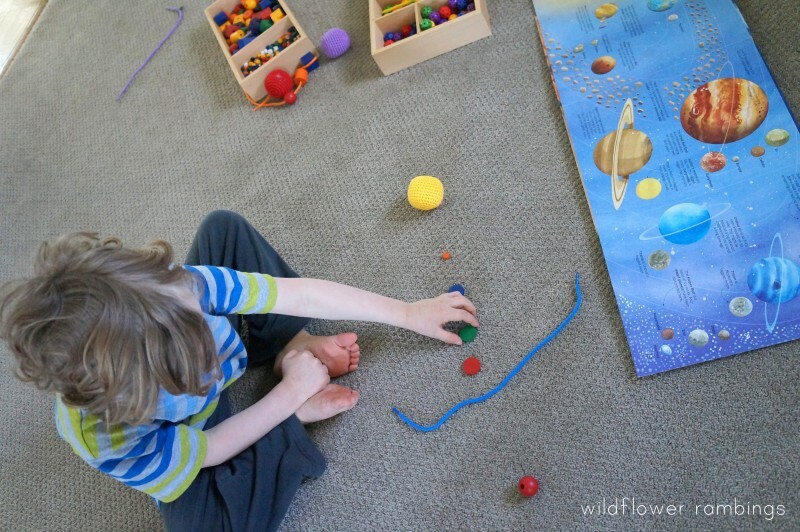 We have been reading many books about space, but using Spielgaben through creating our Solar System and galaxy have been vital in his understanding of how vast and grand the universe really is! 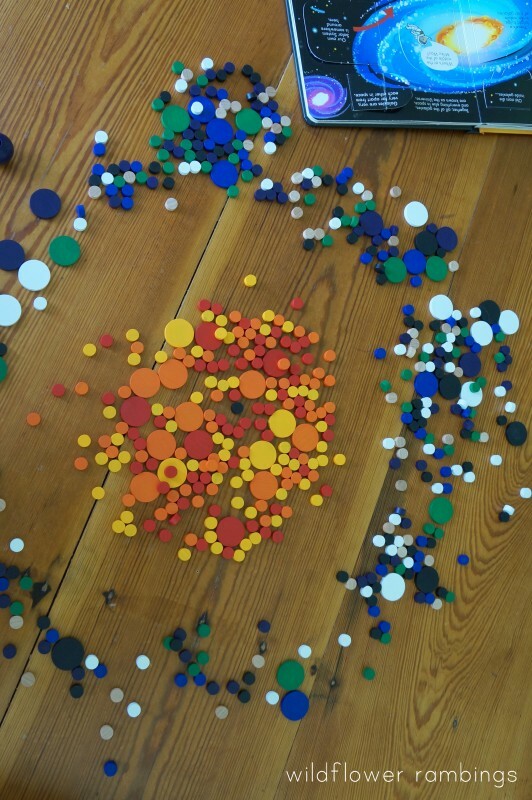 Then, we added the planets, starting with Earth using the points and the wooden, colored shapes. After this, we began from the Sun and named each of the planets: Mercury, Venus, Earth, Mars, Jupiter, Saturn, Neptune, Uranus. 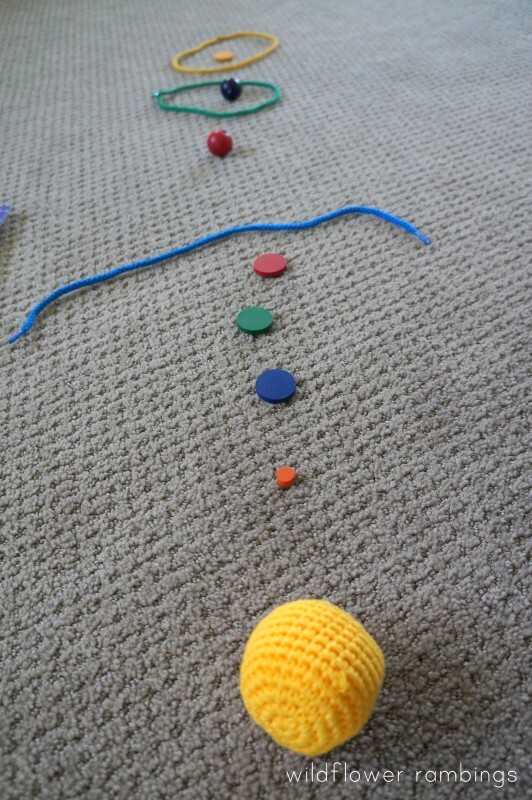 After the planets were placed, we added the asteroid belt between Mars and Jupiter with the lovely strings, and then began adding moons to each planet. Our space books helped us with this, except for Saturn, which I had to look up because it’s number of moons keeps increasing; it has 62 moons, but only 53 are named. 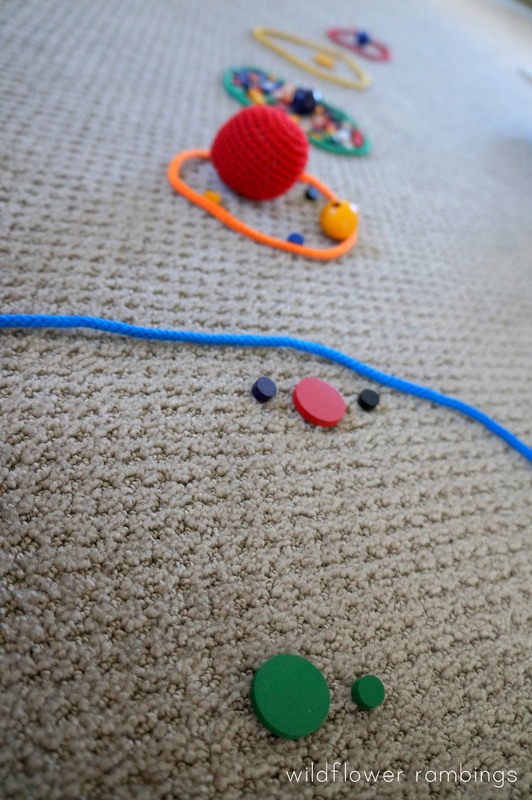 We also added rings, the colorful yarn strings, to the planets, while explaining that the rings are actually orbiting pieces of rock within the planet’s gravitational pull. John also got very excited about creating an imaginary world. Asteroids were exploding and smashing into the planets and the Earth! Then the sun blew up into tiny pieces and our civilization was destroyed! 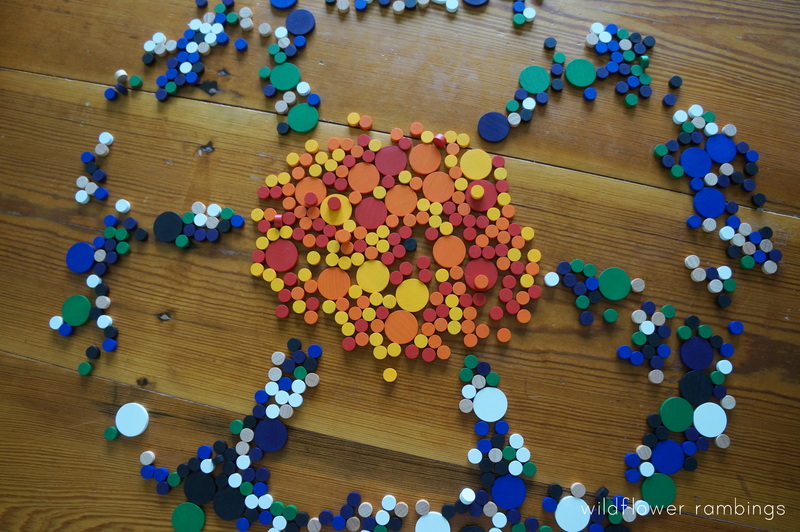 Such lovely opportunities for creative play and imagining with Spielgaben — the possibilities are endless. After creating our Solar System, I wanted to emphasize how very small our Earth is in our Solar System, our galaxy, and the Universe! How infinitely grand is the vast Cosmos! 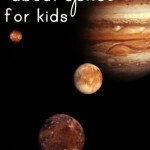 We used some of our favorite space books to guide us on how our galaxy looks in the universe. We also practiced colliding with the Andromeda galaxy, but that shouldn’t happen for four billion more years…. Spielgaben allows you to create every letter, uppercase and lowercase, using the various rods, curves, and circles, which is lovely for young children learning the shapes of each letter. 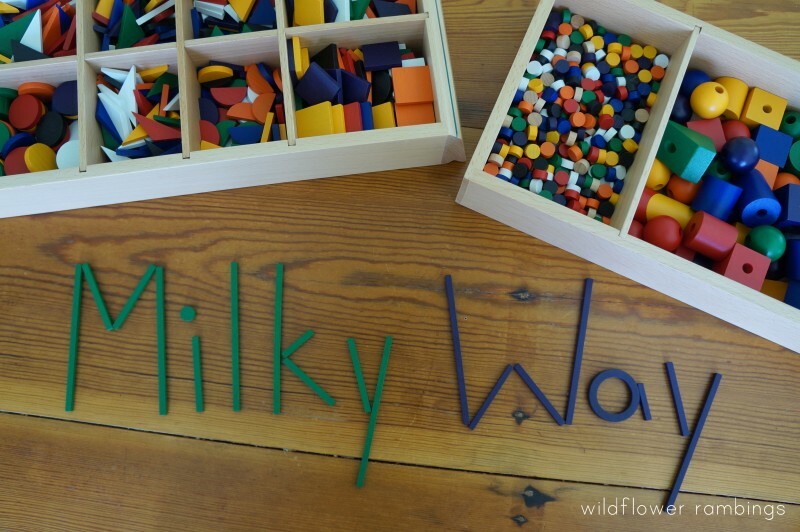 We created the Milky Way, a barred spiral galaxy, using the circular wooden utilizing hand-eye coordination and fine motor skills, we picked out the bright colors of yellow, orange, and red and placed them in the center of our galaxy to symbolize the hot, glowing stars in the middle. These bright stars are the oldest in the galaxy. And, according to what we are reading, at the center is a black hole, which are formed after a star dies and its gases are crushed into a spherical shape. We taped a little sign that said “Our Solar System” on one of the larger rounded discs to represent where we are in our vast galaxy. Our sun and all the planets exist here, amidst all of the other solar systems and stars! Visualizing this was incredibly helpful for John to see the expanse of space and time. We also created an irregular galaxy, called a Cartwheel galaxy, as well as a spiral and a lenticular galaxy (also called a Sombrero galaxy). 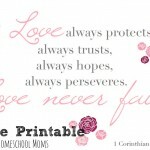 I am learning more about all of this than I ever have before! 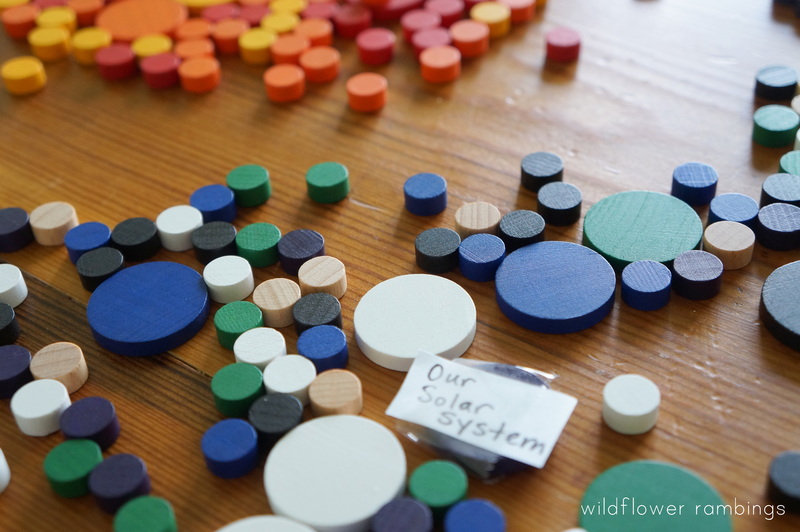 Creating the Solar System and the Milky Way with our Spielgaben set has really brought everything to life!! 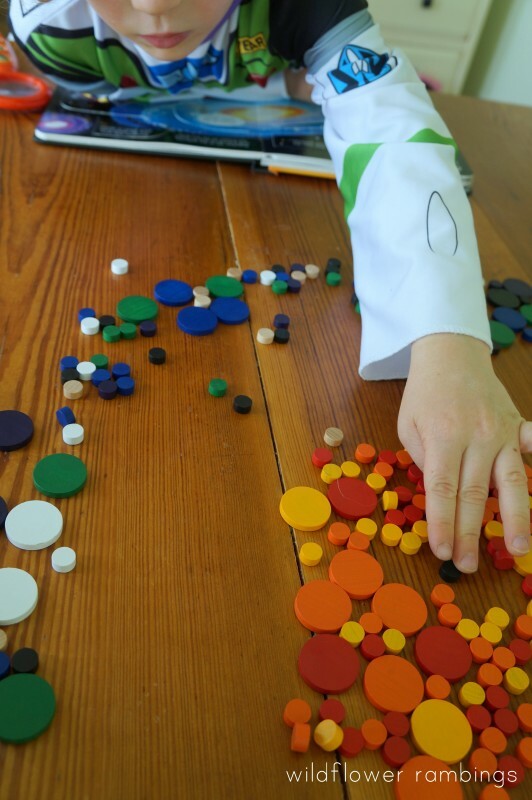 Spielgaben provides children with numerous options for building and creating — all while learning through 2D and 3D representations. 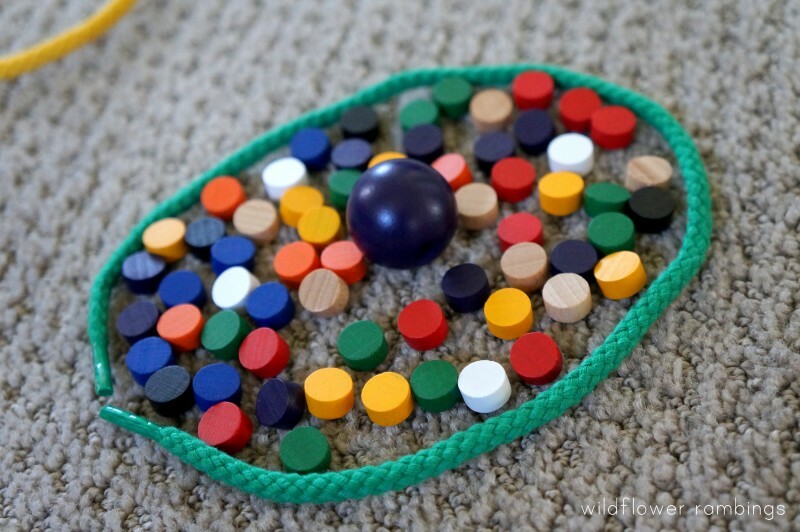 The possibilities are endless for a broad range of learning topics: mathematical concepts of patterning, sorting, counting, geometry, fractions; science; social studies; literature; music; art; geography. What is included in the Spielgaben set? 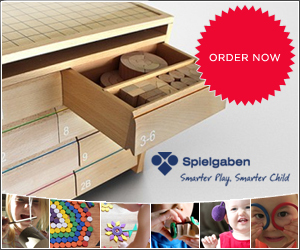 14 sequential Spielgaben sets made of environmentally sustainable and non-toxic children friendly materials. 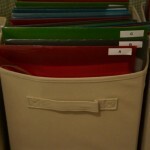 Wooden solid storage drawers with 8 individual storage containers that stores all of the 14 sets neatly and efficiently. Wooden Playboard as well as Dual Side Non-Toxic plastic playboard. 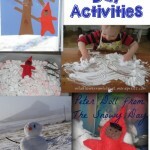 Learning Resources: curriculum based digital learning resources that will help parents how to incorporate play based learning into everyday routine and allow your child to experiment and learn through physical manipulation for many years to come. 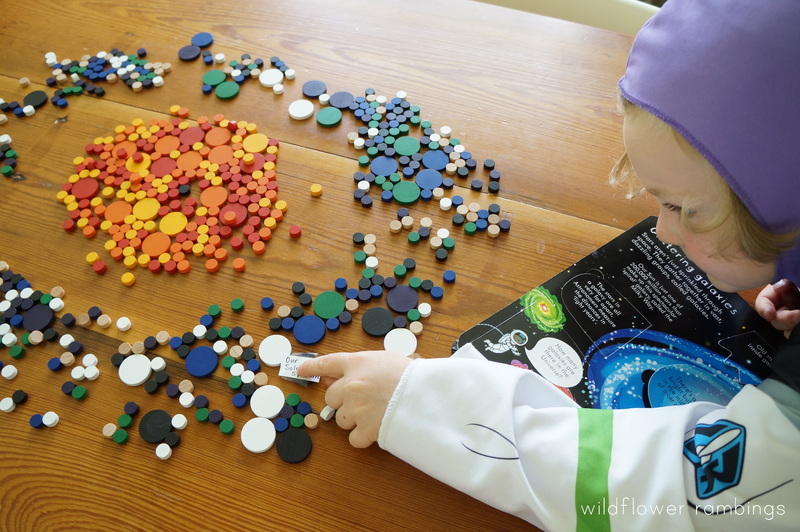 Children are presented with limitless opportunities for play and learning with the Spielgaben set — you can read all the details about each set here. 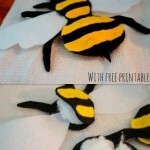 All school topics and interests can be directed like this, through a hands-on, creative approach. 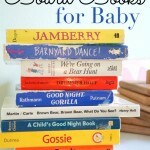 I can’t wait to see what my son is interested in next!! 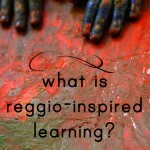 Want to invest in a learning tool that will last a lifetime? Spielgaben’s Version 4 retails at US $449.50. My readers can own this new version at 11% off! As a Wildflower Ramblings reader, you can get the discounted price of US $399.50 which includes shipping to Australia, continental United States and the United Kingdom. All you need to do to claim your discount is send an email to [email protected] mentioning Wildflower Ramblings and you will be provided with a discount coupon! Please check directly with Spielgaben for current discount available, prices change with version updates and conversion rates. This is a sponsored post by Spielgaben, opinions are my own. WOW! I have heard of this company, and seen bits and pieces before – but THIS! Holy smokes! This set looks incredible! 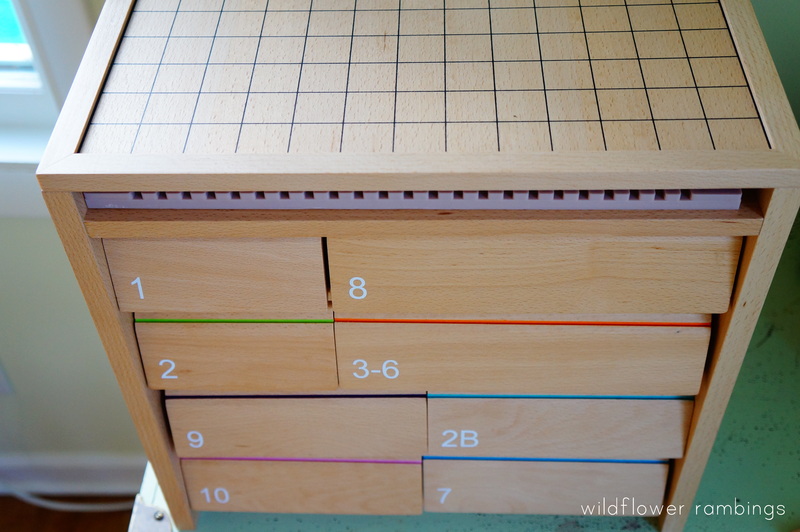 All of the learning that could take place – I would LOVE this set. Do they ship to Canada >>> and if so, would the discount still apply? What a beautiful post Amy. I love this set and I love how you played with it!! Thanks so much Colleen!! We absolutely love it!